The smell of turmeric naturally dyed on fabric takes me straight back to when my mother made fairy costumes for my sister and me. She dyed white singlets and endless swathes of tulle in a big pot of turmeric. I can remember that we both smelled like that wonderful spice for the whole party. What sweet flower fairies we were! Turmeric is fabulous and super easy for special events such as a party dress, to decorate a wedding or event, to show children how to make colour in a safe manner, and even great for dyeing eggs for Easter time. Turmeric is what's called a fugitive dye; this means that the colour will fade pretty quickly regardless of anything you do to it (mordanting wise). But please be aware that the colour will fade in the sunshine and run out in the wash really quickly. Despite that it's a magical colour to dye with and makes me smile every single time! Some notes before you start: remember that natural dyeing and some natural plant based dyes can be toxic. If you intend to boil and dye in your kitchen, please only do so in a well ventilated space and use a pot you won't be using for food purposes. Do some research before you head out foraging for plant material. Wear gloves to protect your hands from any chemicals or chemical reactions. Also, the process of natural dyeing is such that results vary with materials and quantities used. You cannot expect to achieve perfection or repeat performances; you will instead be surprised and amazed each time you unfold your fabric - and that is better than perfection any day! Some plain undyed natural fibres. You can use linen, hemp, cotton, wool or silk. Silk is often the easiest to achieve brighter colours than plant based fibres; but you'll find through experiments that different fibres give different results. Use pieces of fabric, as well as lengths of yarn. Turmeric powder, from your health food shop or the spice section of your supermarket. Find the brightest freshest powder you can find. Or freshly grated turmeric root if you can get that. A big saucepan, glass jars with lids, rubber bands, pegs, string. :: 4L of water and 2 heaped tablespoons of turmeric. To start with: Soak your material in cold water, so that it is totally wet. This allows the dye to permeate all the way through. Half fill your pot with tap water, add the turmeric powder. The amount of powder you use will depend on how much you are dyeing and how vibrant you want the colour. I don't measure. Bring the water to a gentle simmer, and add your wrung-out materials (you can strain off any un-disolved powder before adding your fabric, but I don't bother). At this stage you can either let it simmer on the stove top until the desired colour has been achieved, or you can fill your glass jars with the fabric and the dye water and place it outside in the sun to continue dyeing for a few days. This is called solar dyeing. Once you are happy with your colour, rinse out the fabric. Hang to dry in the shade; your piece will fade in full sun. Turmeric is a fugitive dye, which means it doesn't last as long as some other natural dyes; but I have found that some fabrics take the colour and keep it better than others, so testing your own fabrics is the best thing. The excellent thing is that it's so easy to re-dye once the colour fades, and it gives us a new appreciation of colours and dyes. For this pattern, I simply fold and continue to fold the fabric into squares onto itself, in a concertina manner. Then secure it tightly with pegs or clips along the edges, or wrap it with twine (which will also dye). Dip dyed: An easy and beautifully effective way of allowing the natural process of the coloured water moving up the fabric. This always reminds me of the marks left on sand by waves - you know that slightly transparent line left behind. Ombre continues to be popular - so why not try your hand at making mountain peaks. Start with one end of your fabric in the dye, and the rest hanging out. Leave for at least half and hour. Then slowly move the fabric down into the water a little bit more. Do this as many times as you want, each time leaving it for about half an hour in between. The amount of time you wait before you lower the fabric in, will determine how dramatic the colour change is. 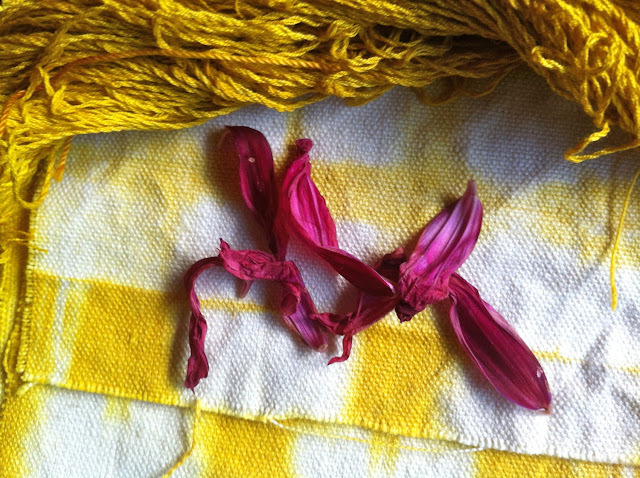 Being a natural dye, this process will not be as predictable as with chemical dye. Scrunch effect: I simply tightly scrunch and then tie (with string that will become coloured as well) or peg the fabric. Place it into the glass bottle and cover with dye. Put a stone on top to weigh it down if need be. Leave this for at least a few days, without agitating or moving it about. The dye will settle into different sections of the scrunch to create the marks; if you move it too many times it won't be as dramatic pattern. If you're interested in doing any natural & botanical dye, be sure to check out my online natural dye course filled with natural dye love. with over 20,000 hits on the one post. Wow - you guys really love sunshine colour!